Other systems only refrigerate wines and preserve wines for only one of two days. Le Grand Cruvinet permits full use control of temperature for red and whites through a full range of temperatures recommended by international experts. In Solid Brass — Stainless Steel — Solid Oak — Solid Walnut — and Solid Mahogany — in 6, 8, 12, 32, and 64-bottle combinations .Custom quantity cabinets are available. A Cruvinet system is a virtually risk-free investment. Wine profits can more than double and with profit margins as high as 300%, premium wine-by-the-glass can be as profitable as specialty drinks!. more information and a color brochure. Handmade cabinets of solid brass, stainless steel, solid oak, walnut, or mahogany. Decor colors are also available. Movable dividers for flexibility in the number of white and red wines offered. Thermopane glass with convenient sliding doors. Panel mounted, remote reading thermometer and thermostat. Cooling indicators and "open door" lights. Stainless steel adjustable siphon tubes. Gas flow gauge and 2-stage regulator. Dividers on most units to keep white and red wines at appropriate temperatures * Interior lights. 110 volt AC. Less than 5 AMP draw; 220 Volt optional. Other great options such as, special decor colors, matching and custom wood finishes, additional refrigeration, stainless steel faucets and security locking. Optional systems with unlimited quantity of faucets. Optional port attachment for outside of machine. 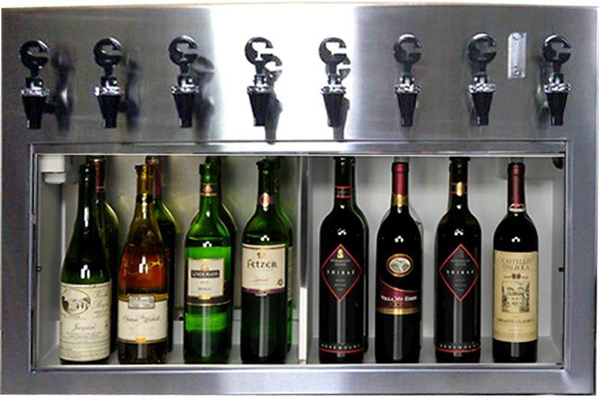 The Cruvinet System is the answer to serving better wines by the glass.